Preserving the past. Ensuring the future. Gordon Kettles house on N. Thornton Ave. between Waugh and Hawthorne. 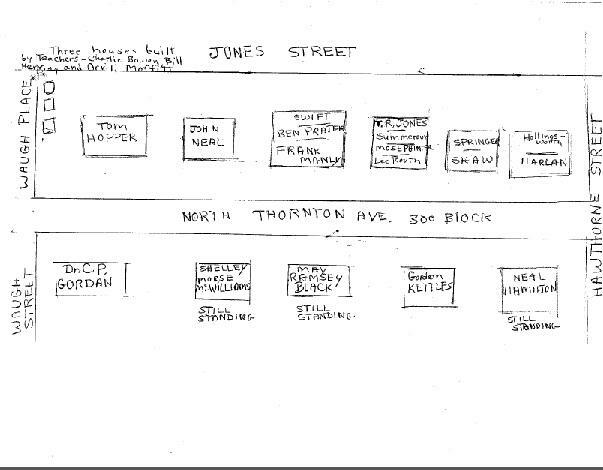 The Gordon Kettles house was located at what is now 314 N. Thornton Avenue (see map). The house burned sometime between 1979-1980. In 1979, 314 is listed as Nelson's Boarding Home by 1980, 314 is VACANT. In 1983 the city directory lists 314 as Under Construction. If anyone has a picture of this house-perhaps it is in the background of a family photo-even an interior photo, please contact the WMHS 706 278-0217 or email wmhs@optilink.us. We would like to make a copy for our records. Thank you! In an effort to bring renewed attention and interest to our archival collections and research materials, the Whitfield-Murray Historical Society welcomes research and inquiry requests. Call ahead to schedule your visit. Let us know what materials or titles you are interested in. If you do not have specific information, please let us know what you are researching so we can prepare appropriate materials for your visit. Photography is allowed in certain instances. Please ask a staff member before taking any photographs. Self-directed research may include a brief orientation of material location/usage. Please note that genealogical inquires and (some others) are typically not accepted over the phone because the information often becomes jumbled and confusing. For those inquiries, please write or email us. Research is done on a time available basis, and is free for members of Whitfield-Murray Historical Society. Non-members, please contact us for information regarding fees and membership. What you hope to find. Specific names, dates, locations, etc. (if known). List of sources already consulted. *Photographs: Photographs in our collection are available for public use; however, digital files are not yet available for most of the collection. Requests are subject to approval and all images used in publications, exhibits, presentations, displays, etc. must be accompanied with “Courtesy of Whitfield-Murray Historical Society” or similar credit line.